An event in the clubhouse at Oracle Park, home of the San Francisco Giants. We recently found ourselves at a football stadium that was playing host to a manufacturing industry conference and trade show. It didn’t take long for us to ask: are sports venues a good fit for corporate events? Let’s face it: finding unique event venues for corporate events with the ever-elusive "aha" factor can be challenging for event professionals everywhere. We are all on the hunt for the extra special place that offers a truly one-of-a-kind experience. Some say it all started when the Beatles performed at Shea Stadium in 1965. Today, sports stadiums and arenas regularly open their doors to conventions, trade shows and conferences. It is a fantastic source of revenue for the stadiums and have the potential to offer a unique experience for a corporate event. Many sports venues have built in charm with loads of local flavor and history. Many also come equipped with state-of-the-art audiovisual capabilities, Wi-Fi, 4K or HD screens and gourmet eateries destined to please the most finicky palate. All of this sounds great, but before you make the leap to say yes to a ballpark or basketball arena as your next event venue, be sure to think about all the potential pros and cons. Here are just a few that caught our attention. 1. Location. In many cases, sports venues are located within a short distance of major hotels — making it easy for your attendees. 2. Cache. Sports fan or not, everyone will be excited about going to an event at a sports arena or stadium. 3. Audiovisual Capabilities. Many of the new or recently renovated facilities have state-of-the-art AV capabilities, as well as on-site staff to help manage all of the technical/production element. 4. Catering. One of the fun things about stadium experiences can be the food. Now it is common to find gourmet treats, local food artisans, and a staff capable of serving thousands of people quickly. 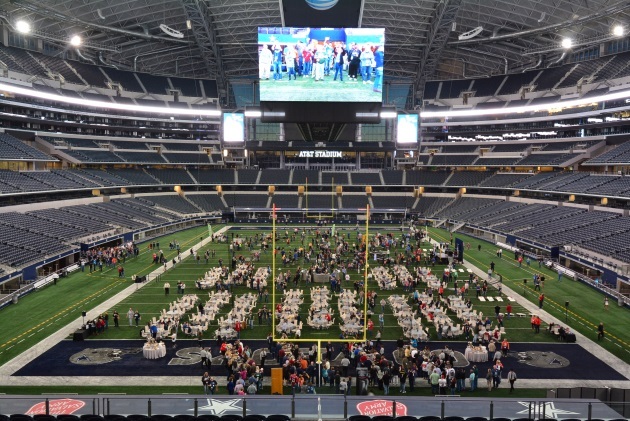 An event on the field at AT&T Stadium in Arlington, Texas. 1. Budget. We talk about the importance of budget management a lot in our blogs. It is something event professionals need to watch especially close when hosting an event at a sports venue. Be mindful of extra labor costs, service fees, and ancillary items that may not be part of your venue rental fee. 2. Layout. Stadiums and arenas are huge properties, but sometimes the layout is not the right fit for a corporate event. Go into the site selection process with as much information about the event requirements as you can and make sure the venue has enough separate spaces for your program. 3. Event Staff. 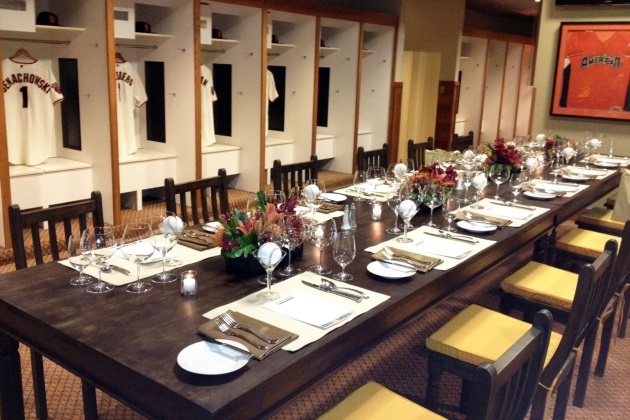 Every sports venue should follow the example set by the San Francisco Giants and establish an events team dedicated to the corporate event business hosted at their venue. Not every sports facility has adopted this approach, but they should. You really need to have people on your staff dedicated to the corporate events and all the nuances and differences they represent from a regular game event. 4. Security. Make sure to find out all of the security requirements the venue will impose on your event and your attendees. It is important to understand how strict their security requirements are to avoid any surprises that may impact your budget and/or the attendee experience. If you find yourself scheduling a site visit at a sports venue for your next corporate event, keep this list of pros and cons handy. More importantly, though, go with an open mind and a pocket full of imagination. Give yourself the ability to think outside the convention center box and see how your event may work at a stadium or arena. You never know, you may just hit a home run. Wendy Parsley is the co-founder and partner of Quint Interactive, which creates high-touch, integrated marketing programs that connect forward-thinking brands with people and communities. Wendy has a deep understanding of what it takes to design, build, deliver and analyze brand experiences for clients across multiple industries. She has a proven track record in the successful development and execution of marketing strategies.